Thank you for enrolling in this Diabetes training, presented by the National Association Directors of Nursing Administration in Long Term Care (NADONA/LTC). The next few screens will explain how to move through the training. To get to the next screen you can click the forward arrow in the bottom-right corner. As you progress through the course, you’ll notice that there are several items that may appear on the screen. These include text, graphics, and interaction elements. For example, sometimes you’ll see a scroll bar to the right of the text. Whenever that scroll bar appears, it means that there’s more text beyond the bottom of the screen. If you see the scroll bar, be sure to use it to view all of the text. On the left side of the screen, you’ll see the navigation menu. Each item in that menu represents a Module of the course. To see a list of the Units in each Module, simply click your mouse cursor over one of the Module names. This program is provided for discussion and educational purposes only and should not be used or in any way relied upon without consultation with and supervision of a qualified practitioner based on the case history and medical condition of a particular patient. The National Association of Directors of Nursing Administration in Long Term Care (NADONA/LTC), its heirs, executors, administrators, successors, and assigns hereby disclaim any and all liability for damages of whatever kind resulting from the use, negligent or otherwise, of this training. The utilization of the NADONA/LTC diabetes program does not preclude compliance with State and Federal regulation as well as facility policies and procedures. They are not substitutes for the experience and judgment of clinicians and caregivers. The diabetes program is not to be considered a standard of care but is developed to enhance the health care professional’s ability to practice. Each year in the U.S. alone, approximately 1.3 million people die needlessly from diabetes and its related illnesses. Diabetes is a slowly building epidemic, and is considered a public health crisis in the U.S. Nearly 21 million Americans are diagnosed with diabetes today and experts estimate there are an additional 6 million who have yet to be diagnosed. Forty-one million more have “pre-diabetes.” Current preventive initiatives seem inadequate to address the problem. There has been a continuing upward trend in the number of persons who develop diabetes each year. If the present pace continues, there could be as many as 35 million diagnosed cases in the U.S. by the year 2050, a 165% increase. This module is designed to help you become aware of the extent and seriousness of the problem of diabetes in the U.S. today, along with current barriers to effective prevention and treatment. Define the scope of the diabetes problem in the U.S.
Identify some health risks of diabetes. Understand the financial implications of diabetes treatment. A Slowly Building Epidemic Diabetics represent 26.4% of all admissions to long-term care facilities. On the average over the last 50 years, the prevalence of diabetes in the U.S. has been increasing by about 5% per year. The prevalence of type 2 diabetes increases with age; among people aged 60 and over, 10.3 million (20.9% of all people in this age group) have type 2 diabetes. Admission assessments in the Minimum Data Set recorded throughout the United States during 2002 identified 144,969 residents with diabetes, representing 26.4% of all admissions. In the last 10 years there has been another 80% increase in the number of diabetics. For young people the numbers are especially alarming. Without preventive action, one in every three American children born in the year 2000 will develop diabetes in his or her lifetime. Obesity, recognized as a growing epidemic among U.S. teenagers, is closely linked with the increase in adolescent diabetes. Among U.S. ethnic groups, Blacks, Hispanics, and Native Americans are 1.6 to 2.3 times more likely to have diabetes than non-Hispanic Whites. More than half (60%) of hospital admissions have diabetes as a “significant causative factor.” About one-third of Nursing Facility (NF) residents have diabetes or “pre-diabetes.” At the same time, a significant number of NF residents do not have diabetes listed as a diagnosis in spite of the fact that they are taking prescribed anti-diabetes medications. Diabetes is a significant risk to life and health. It’s the primary cause of premature death and disability in the U.S. Table I shows just a few of the ways that having diabetes increases an individual’s risk of serious illness. Let’s consider just a few of the risks shown in the previous table. An individual with diabetes has a 400%25 to 500%25 greater chance of having a heart attack, a 250% 25 greater chance of having a stroke, and a 522% 25 greater chance of dying from a stroke, than an individual without diabetes. Vision and hearing impairment are extremely prevalent among diabetics, and more than two-thirds of persons requiring lower extremity amputations have diabetes. It’s clear that diabetes is not a trivial illness, yet less than 2% of diabetics receive optimal quality of care. Only 7.3% of diabetics under treatment achieve target glucose, blood pressure, and cholesterol goals. In addition, diabetes is the leading cause of End-Stage Renal Disease. The implications are clear: diabetes is not trivial. It’s a serious condition that poses dangerous risks to the life and health of those who have it. According to estimates, what percentage of diabetics receive optimal levels of care? A one point reduction in A1C can reduce health risks significantly. Table II shows the health benefits that can be achieved with this modest reduction. Financial Impact Diabetes care in the U.S. today costs about 19% of the healthcare dollar. Diabetes care in the U.S. today costs about $150 billion annually-19% of the healthcare dollar. That figure is expected to rise to $192 billion by 2020. Expenditure associated with diabetes and related issues amounts to 27% of Medicare costs. In 2003, more than $27 billion was spent on care for End-Stage Renal Disease (ESRD). Diabetics miss an average of 8.3 days of work each year, compared with 1.7 missed work days among those without diabetes. This number could be reduced by 50% with effective management and education. Considering both the health risks and the financial impact of diabetes, we might expect that its prevention and treatment would be a high priority for the healthcare profession. Unfortunately, there are indications that such is not the case. As mentioned earlier, the incidence of diabetes Type 2 is on the rise. The barriers to diligent preventive and intervention care fall into two general categories: attitude and education. Changes must occur in both categories if we want to help stem the diabetic epidemic. Few outside the healthcare profession understand the risks of diabetes. The very complexity of diabetes makes it hard to address in today’s assembly-line medical culture. Its chronic nature, pre-existing conditions, and concurrent co-morbidities require a great deal of time and commitment from a spectrum of health care professionals. Moreover, the attitude of the general public and those having diabetes is a barrier. Many lack the understanding that diabetes is a serious disease that requires diligent treatment. We live in a “fast-food” nation where the nutritional value of food is trivialized. Few outside the healthcare profession truly understand the risks of the disease or the benefits of treating it. There are also aspects of ageism and cultural bias that make some segments of the population more vulnerable. Most dangerous of all, though, is resistance within the healthcare profession: we may be tempted to overlook a potential problem. If we don’t look, we don’t have to diagnose. If we don’t diagnose, we won’t be required to test, chart, treat, and monitor. Despite the growing body of knowledge about diabetes prevention and care, we’re still not communicating clearly enough to affect change. Too many people fail to take diabetes seriously, and there’s a lack of regard for accepted standards of care among both healthcare professionals and persons with diabetes. Further, among healthcare professionals, there is a surprising ignorance of government funding available to help. Government policies support medically necessary NF visits to improve diabetes medical management, and provide diabetes medical education by Certified Diabetic Educators. In addition, funding is available to supply footwear and other diabetic supplies, and in some cases, blood glucose testing. Diabetes is a serious problem, but it’s possible that we’re not taking it seriously enough. For all the knowledge we’ve gained, for all the strides we’ve made in treatment, the problem is increasing at “slow epidemic” rates. The modules in this training series will help guide you to a better understanding of the disease and its co-morbidities, how to evaluate the diabetic patient, treatment options, and care guidelines. Diabetes can be defined as a group of disorders caused by either insufficient production or ineffective action of insulin. A person with diabetes is unable to properly metabolize food into energy, and excessive glucose remains in the bloodstream. Pre-diabetes and Metabolic Syndrome are related disorders that usually indicate a risk for diabetes. The causes of diabetes are both genetic and environmental. Diabetes comes from the Greek word for “siphon,” due to one of the most easily observed symptoms of the disease: persons with diabetes urinate excessively and experience constant unquenchable thirst. This symptom is seen in two syndromes – Diabetes Mellitus (commonly known as “sugar diabetes”) and Diabetes Insipidus. Mellitus comes from the Latin word for “honey.” Excessive glucose in the blood overwhelms the kidneys and spills over into the urine. Physicians used to diagnose diabetes by tasting the urine for sweetness. Insipidus comes from the Latin word for “lacking flavor.” Like Diabetes Mellitus, this form of the disorder also causes excessive urination. Diabetes Insipidus, however, is caused by insufficient production or ineffective action of Anti-Diuretic Hormone (ADH) and is unrelated to insulin production or utilization. This course focuses on Diabetes Mellitus. Diabetes Mellitus falls into two categories: Type 1 and Type 2. Type 1 diabetes is defined as an absolute deficiency of insulin secretion, caused by an auto-immune disorder that destroys insulin-producing cells in the pancreas. It usually presents at an early age with a rapid onset of severe symptoms. Less than 10%25 of all diabetics are Type 1. Type 2 diabetes is defined as a group of disorders characterized by impaired insulin secretion or unexplained insulin resistance. It usually presents in adulthood (onset at about age 40 and up) and symptoms may appear very slowly – about half of Type 2 diabetics are unaware they have the disease until they are tested for it. About 90%25 of diabetics are Type 2. These categories are described in depth in a later module. By contrast, hyperglycemia is defined as unusual high blood sugar. Blood sugar levels higher than 126 can cause transient or permanent damage to the cells (especially to the cell membrane). Symptoms may include extreme thirst; “fruity” smelling breath; deep, rapid breathing, weakness, lethargy, and confusion. In severe cases, dementia or convulsions may result. Diagnostic criteria and interventions are described in depth in a later module. Type 1 causes low blood sugar while Type 2 causes high blood sugar. Type 1 is caused by an absolute deficiency of insulin secretion, and usually presents at an early age. Type 2 affects only a small percentage of people. Type 1 is caused by insufficient or ineffective Anti-Diuretic Hormone. Without preventive measures, almost everyone with pre-diabetes will develop diabetes within 10 years. Those who have fasting glucose levels above normal, but not in the diagnostic range for diabetes, are considered to have pre-diabetes (impaired fasting glucose). Pre-diabetics usually have no noticeable symptoms. Up to one-quarter of persons with pre-diabetes will develop diabetes within five years, and almost all will develop diabetes within 10 years, unless preventive measures are taken. For these persons, a 5 to 7%25 weight reduction can significantly reduce the risk of developing diabetes. Women who had gestational diabetes or gave birth to a baby weighing more than 9 pounds are particularly at risk for developing pre-diabetes. Often associated with pre-diabetes, metabolic syndrome (formerly referred to as Syndrome X) is characterized by excessive weight around the waist, elevated triglycerides, low levels of high-density lipids (HDL), and/or hypertension. The presence of metabolic syndrome along with pre-diabetes triples the risk for heart attack or stroke, and doubles the chances of mortality in those conditions. It is also associated with an increased predisposition to thrombosis (blood clots) and chronic inflammation. A person’s health is at risk only if their blood sugar level is well into the diabetic range. Most people with above-normal blood sugar who are not diabetic can reduce their risk of developing diabetes by losing weight. People with diabetes often have high levels of triglycerides and LDL, along with high blood pressure. People with diabetes can have an increased risk of heart attack or stroke. For about 4 percent of pregnancies, the mother will develop a temporary decrease of glucose tolerance. Blood sugar usually returns to normal. This temporary form of diabetes during pregnancy is known as Gestational Diabetes. Women who are pregnant should be tested for glucose intolerance at the onset of pregnancy, at about 24 to 28 weeks into the pregnancy, and again 6 weeks post-partum. Further, any disease or trauma of the pancreas may affect a person’s ability to create insulin. Conditions such as pancreatitis, certain viral infections, and pancreatic cancer may contribute to the development of diabetes. In addition, genetic defects of the beta cells may cause an impaired sensitivity to elevated blood glucose. The amount of sugar in the blood can be measured and the results used to determine whether a person has diabetes. The two most common tests are Fasting Blood Glucose (FBG) and Random Blood Glucose (RBG). FBG testing is done at the end of an 8-hour period without food, and is currently the preferred diagnostic test. The Glucose Tolerance Test (GTT) is considered less reliable and has fallen into disfavor except in cases of pregnancy or as an additional test to confirm borderline cases. GTT is measured 2 hours after a dose of 75 grams of glucose has been administered. Table III shows the diagnostic levels for each of the above-mentioned tests. Table IV shows the relationship between A1C and average blood sugar. Hemoglobin, the protein in red blood cells, can become covered in sugar (“glycosylated”) when exposed to high plasma levels of glucose. Once a hemoglobin molecule becomes glycosylated, it remains that way. Glycosylated hemoglobin is abbreviated as A1C. A buildup of A1C molecules reflects the average amount of glucose to which the red blood cell has been exposed during its life cycle. Measuring A1C provides insight into the long-term effectiveness of therapy; its level is proportional to average blood glucose levels over a period of up to three months, with the most recent four weeks having the greatest effect. Over time, occasional high blood sugar will cause red blood cells to become “glycosylated” (covered in sugar). Diabetes Mellitus (usually called simply “diabetes”) is the official name for a group of disorders related to a person’s ability to make or use insulin. Above-normal levels of glucose in the blood indicate that a person either has, or is at risk for, diabetes. There are two classifications of diabetes: Type 1 and Type 2. Both classifications depend on both genetic and environmental factors. Diabetes is not defined by the presence or absence of symptoms. At least half of persons with pre-diabetes or Type 2 diabetes experience few or no symptoms and remain undiagnosed unless they happen to receive blood tests. Blood sugar levels, preferably tested by Fasting Blood Glucose levels, are the only reliable diagnostic indicators. If you’ve ever driven through a mountainous region, you may have seen warning signs such as “falling rocks” or “bridge ices before road.” These signs don’t indicate that you’ll definitely encounter rocks or ice, but they do indicate a strong potential for those dangers to occur. In a similar way, diabetes has its own warning signs, known as “risk factors,” that indicate a strong potential for the disease to occur. If diabetes does develop, it can take one or both of two forms: either the person with diabetes is unable to make enough insulin, or the body becomes resistant to insulin, or both. In either case, diabetes causes long-term and potentially disastrous damage to the body’s cells through a process called osmosis. There are a number of risk factors that indicate the potential for a person to develop diabetes, some of which are beyond an individual’s control. For example, a person with an immediate relative who has diabetes is at greater risk for diabetes him/herself. In addition, a person’s ethnicity may be a risk factor. Native Americans, African Americans, Latinos, Asians, and Pacific Islanders are all more likely to develop diabetes than other ethnic groups. On the other hand, some risk factors are within an individual’s control. Obesity, lack of exercise, high blood pressure, high cholesterol, and high triglycerides are all associated with increased likelihood of developing diabetes, and all can be addressed with lifestyle change and/or medical treatment. Obesity in particular has an influence on an individual’s risk for diabetes, and some evidence shows that those who store fat primarily in their midsections are at even greater risk. This risk may be due to accumulation of fat cells around the pancreas and liver. The standard measure for obesity is Body Mass Index (BMI). BMI is calculated as a ratio of weight to height. Figure 2.3.1 shows two formulas for measuring BMI: one using pounds and inches and one using kilograms and centimeters. Expert opinions vary slightly, but a BMI of about 24 is considered Normal. BMI of about 25-29 is considered Overweight, about 30-39 is considered Obese, and greater than about 40 is considered Extremely Obese. Persons who are obese are at increased risk for developing diabetes. Body Mass Index is the standard measure of obesity. At what BMI range is a person considered obese? Insulin is a hormone produced in the pancreas. It helps the body’s cells take in glucose (sugar) from the bloodstream and use it as fuel. Under normal circumstances, when the body senses an increase in blood sugar, the pancreas will automatically release insulin to the level needed. In persons with diabetes, there is not enough insulin to adequately manage the amount of glucose in the blood. In some people, the pancreas is unable to make enough insulin (insulin insufficiency). In others, the pancreas may be making insulin, but other factors prevent the body from utilizing it properly (insulin resistance). These conditions are inter-related.<b></b> A related hormone called glucagon is also controlled by the pancreas. This hormone assists the body to store excess glucose when blood sugar levels rise and release stored glucose when blood sugar levels are low. If high blood sugar is allowed to continue…cells can become seriously dehydrated. Osmosis is the process by which fluids move from one side of a semi-permeable membrane to the other to compensate for a difference in concentration. When there is too much glucose in the blood cells, your body will attempt to dilute the blood. Water from other cells, such as muscle tissue, will move across the cells’ membrane into the bloodstream. If the high blood sugar is allowed to continue, the affected cells can become seriously dehydrated. Such dehydration can be particularly damaging to cells of the brain and to the capillary membranes of the body’s various organs. For persons with diabetes, how does osmosis damage the body? It makes blood too thick to move through the body, which can lead to heart attacks or stroke. It causes dehydration of cells, such as those that make up organ and muscle tissue. It prevents nutrients from crossing the membrane surrounding the blood vessels. The osmosis caused by continuing high levels of blood sugar can lead to a dangerous condition called Hyperosmolor Hyperglycemic Nonketotic Syndrome (HHNS). Symptoms of HHNS include high fever, confusion, loss of vision, or hallucinations. HHNS can occur in type 1 diabetics but is more often seen in type 2 diabetics. It is most frequently seen in older persons and is usually brought on by illness or infection. When the body’s cells are unable to access glucose for fuel, they will begin to break down fat and muscle to use for fuel instead. The resulting fatty acids, when oxidized, become ketones: strong acids that are poisonous to the body. Acetone, the chemical used in nail polish remover, is a form of ketone. Persons with diabetes type 1 are particularly at risk to develop dangerously high levels of ketones, a condition known as <i>Diabetic Ketoacidosis</i> (DKA). DKA can be life-threatening. More information about symptoms of DKA can be found in a later module. Diabetes is associated with several unhealthy and even dangerous conditions. Some of these conditions occur prior to diabetes and may contribute to its development. Others are potential results of diabetes. In addition, certain hereditary factors can make a person more likely to develop diabetes. Undiagnosed or inadequately treated diabetes can have disastrous effects. This is true for both type 1 and type 2 diabetes. As discussed in Unit 2 of this Module, hypoglycemia (unusually low blood sugar) and hyperglycemia (unusually high blood sugar) pose serious health risks. In either case, variation from normal blood sugar levels can lead to long-term damage to the body and, in extreme cases, can be fatal. Symptoms of hypoglycemia range from shakiness to loss of consciousness. Symptoms of hyperglycemia range from headache to coma. If symptoms are present, appropriate action should be taken immediately. You will need to know how to determine the degree of variation from normal and the interventions required. In addition, you’ll find it helpful to know predisposing factors. Knowing what to watch for can help you to act quickly when action is needed. Variation from normal blood sugar levels can lead to long-term damage. Take an appropriate history to include medications which may predispose an individual to abnormal blood sugar levels. Hyperglycemia is defined as blood glucose level of above 125 Fasting Blood Sugar or 200 Random Blood Sugar. Eating irregularly or skipping meals can lead to sudden drops in blood sugar. Residents should be encouraged to eat meals at regular times. Sudden increases in activity such as “shopping during Christmas or a New Year’s resolution to exercise to lose weight” can lead to a drop in blood sugar. Additionally, any change in medication should be followed by careful blood sugar monitoring. If a resident experiences an acute medical condition which causes cognitive impairment such as delusions they may be unable to report signs and symptoms of hypoglycemia and therefore should be carefully monitored. If an NPO order has been given prior to lab testing, the missed meal may result in hypoglycemia. <i>Be vigilant regarding such orders and make sure fasting is an absolutely necessary factor for the lab work being ordered. True or False? Eating irregularly or skipping meals can lead to sudden drops in blood sugar. Depending on the level of severity, hypoglycemia and result in symptoms ranging from headache to loss of consciousness. Symptoms of hypoglycemia are listed below. If symptoms are present and hypoglycemia is suspected, immediately have the resident sit or lie down to prevent injury. Then test the resident’s blood glucose level. In cases of impaired consciousness, however, first administer glucose and then test blood sugar to confirm suspicion of low blood sugar. If swallowing is difficult or impossible, administer insta-glucose or apply cake icing or sugar to the inner aspect of the resident’s gums. If no other route is available, 30 ml of syrup or honey may be administered rectally. Repeat testing in 15 minutes and administer sugar again if needed. After two attempts to administer glucose orally, if blood sugar levels have not stabilized, 1 mg Glucagon should be administered IM. Inject the entire ampule into the resident’s upper arm, thigh, or buttocks. The resident should be made to lie on his or her side in case of nausea associated with glucagon. If there is no response within 15 minutes, repeat injection and call 911 per facility protocol. Those who are able to swallow may take glucose tablets, packets of sugar, fruit juice, honey, or syrup. Once the resident is more alert additional food should be given, such as peanut butter crackers, fresh fruit, milk, a cheese sandwich or regular (not diet) soda. True or False? Administration of Glucagon is an appropriate intervention for Mild to Moderate Hypoglycemia. After the episode has been resolved, continue to monitor hydration. Review the resident’s care plan and prescriptions for possible contributing factors. Notify the resident’s physician/practitioner, especially if the episode was severe (required glucagon or IV intervention). Nicotine and excessive caffeine can raise blood sugar. These medications and supplements are listed fully in the “Tips” for this page. In addition, nicotine and excessive caffeine can raise blood sugar, although moderate amounts of caffeine may actually be beneficial. Some symptoms of hyperglycemia may resemble symptoms of hypoglycemia. Some symptoms of hyperglycemia may resemble symptoms of hypoglycemia. Therefore, always attempt to test blood sugar prior to taking action. The goal of today’s treatment regimen is “tight glycemic control. Auto-pilot monitoring with unaddressed, frequent elevations in blood sugar is no longer considered acceptable medical practice. Residents who are known to be diabetic or pre-diabetic should have life-long periodic monitoring at least every three months. All interventions should be individualized. Consider oral agents that are less likely to cause hypoglycemia, for example Thiazolidinediones, Januvia, or Metformin (unless there are kidney or liver problems). Keep insulin regimens simple: consider basal/bolus approach. In end-stage situations, the primary goal is to still relieve symptoms, and to prevent hypoglycemia and/or acute complications. Keeping blood glucose levels routinely within target values. Administering treatment if levels frequently fall outside the normal range. Administering treatment only if resident shows symptoms of hypo- or hyperglycemia. Determining average glucose levels over a period of time, and designing treatment for that average. Any clinical change should be considered a “significant blood sugar event” until proved otherwise. Stress or illness can cause increases in glucose levels. Therefore, if a resident is depressed, has other psychological stressors, or has a fever or infection, increase glucose monitoring. Also monitor urine for ketones, and monitor and maintain hydration. Use an easily digestible liquid diet containing carbohydrates and sodium. If indicated, consider supplemental short acting insulin. True or False? Any clinical change should be considered a “significant blood sugar event until proved otherwise. Whether too low (hypoglycemia) or too high (hyperglycemia), deviations from normal blood glucose levels can lead be harmful – even dangerous. Residents with a history of such deviations should be closely monitored, especially if any of the pre-disposing factors are present. Memorize the signs and symptoms of both hypoglycemia and hyperglycemia and be prepared to intervene quickly if these events occur. Because it injures the cell’s wall, diabetes has an effect on virtually every organ system. Some pre-existing diseases or dysfunctions are made worse by the effects of diabetes. In other cases, diabetes may be the root cause of another disease. A diabetic co-morbidity is a disease that is associated with, caused by, or made worse by diabetes. The primary danger of abnormal osmosis is dehydration of cells. You may remember from unit 3 that diabetes affects the density of cells and results in abnormal osmosis. The primary danger of abnormal osmosis is dehydration of cells, particularly in the capillaries. Damage to the endothelial cells lining the capillaries is known as diabetic endothiliopathy, and can lead to abnormal passage/seepage of nutrients and waste products. This results in widespread damage to surrounding cells and alteration of cell metabolism. In addition, diabetes damages the kidneys’ baroreceptors (pressure monitors). The resulting hypertension may eventually result in hardening of the arteries (atherosclerosis), which is a form of arteriosclerosis characterized by the deposition of plaques containing cholesterol and lipids on the innermost layer of the walls of large and medium sized arteries. Atherosclerosis impairs the vessel’s ability to dilate, cutting off blood supply to surrounding cells. Imagine an individual who has high blood pressure, high cholesterol and triglycerides, reduced blood flow, a compromised immune system, and problems with blood clotting. Diabetes can be a factor in each of these disorders. One alone can be dangerous; in combination they can be devastating. Therefore, the importance of controlling blood sugar levels cannot be overstated. The next few pages describe diabetes-related disorders for various systems of the body. Any elevation of blood sugar can suppress the immune system. Diabetes is known to affect lipid metabolism, making diabetics more susceptible to increased levels of cholesterol and triglycerides. As mentioned above, diabetics are also more susceptible to atherosclerosis and have an increased risk of both heart attack and stroke. Furthermore, even though diabetes is often accompanied by high blood pressure, diabetics may have difficulty with sudden drops in blood pressure when they stand up from a seated position, a condition called Orthostatic Hypotension. Resulting dizziness can lead to falls. Blood coagulation disorders associated with diabetes can increase the risk of blood clots. A blood clot in a vessel or in a cavity of the heart is called Thrombosis. If that clot travels and blocks a smaller vessel, it’s called an Embolism. An embolism in the lungs (Pulmonary Embolism) can be life threatening. Poor circulation, combined with infection, can lead to gangrene in a limb and may require amputation. Diabetic Retinopathy is the leading cause of blindness among American adults. Problems with the eyes are common for individuals with diabetes. Diabetic Retinopathy (disease of the retina) is the leading cause of blindness among American adults. More than half (60%) of diabetics have damage to the retina, although the damage may be mild enough that vision is not yet affected. This damage is progressive, worsening over time. The earliest stage is called “mild nonproliferative,” and is characterized by very small aneurysms of the retina’s tiny blood vessels. The next stage is called “moderate nonproliferative.” In this stage, some of the blood vessels become blocked. In the “severe nonproliferative” stage, more blood vessels are blocked and the retina starts sending signals to the body to grow new blood vessels. The disease then reaches the “proliferative” stage, growing new vessels that are abnormal and fragile. If these vessels leak blood, it can result in severe vision loss or blindness. Impaired metabolism can also cause increased levels of sorbitol, a sugar alcohol, leading to fluctuations of fluid levels in the lens of the eye and resulting in cataracts. True or False? Diabetic Retinopathy is the leading cause of blindness among American adults. Older adults in hospitals or long-term care settings already have an increased risk of illness due to a particular kind of bacterium called Clostridium difficile, or “C. diff.” This is a bacterium that proliferates when antibiotics are being used to control an infection. C. diff. infections have been on the increase in recent years, and diabetics are more at risk than the general population of older adults. The effects of C. diff. infection range from mild diarrhea to swelling and inflammation of the colon (Colitis). In some cases, C. diff. can be life threatening. Diabetics may also experience a reduction in the muscle action that helps move waste through the intestines. Gall bladder disease and pancreatitis are also associated with diabetes. Pancreatitis may be a result or a cause of diabetes. Uncontrolled diabetes may ultimately result in kidney failure. As mentioned earlier, diabetics face an increased risk of infections overall. This is just as true in the case of genitourinary infections. In addition, damage to the central nervous system may make it difficult for diabetics to sense a full bladder, a condition known as Neurogenic bladder. Diabetes is also known to have lasting detrimental effects on the kidneys. Insufficient kidney function can be linked to abnormal spillage of proteins into the urine, a condition known as Proteinuria. All diabetics with proteinuria are also hypertensive. The effect of uncontrolled diabetes on the kidneys is progressive, and may ultimately result in kidney failure, or ESRD (End Stage Renal Disease). Diabetes causes damage to the nervous system too. In recent years, studies have shown a linkage between diabetes and depression, particularly in women. For men, about half of those with diabetes may suffer from erectile dysfunction. Damage to the nerves may reduce the ability to sense heat or pain. On the other hand, nerve damage may cause sensations of burning, stabbing, or tingling. Diabetics may have difficulty telling if the foot is raised high enough when walking, causing an increased risk of tripping. Constant nerve damage may also lead to a condition called Charcot’s joint, a progressive degenerative disease affecting weight-bearing joints. The detrimental effects of diabetes are wide-ranging. Virtually every part of the body can be harmed; in many cases that harm can lead to multisystem failure and may be fatal. The information contained in this training should serve as a stimulus to an increased commitment to diabetes care and treatment. In the Module 2, you leaned about the definition of diabetes and the scope of the problem in the U.S. You also learned about diabetic co-morbidities. In this module, you will learn more about evaluating and treating the diabetic resident. This unit focuses on screening and evaluation: how to determine the resident’s condition. Residents should be evaluated for diabetes at least every 3 years. Fasting or pre-meal glucose levels should be maintained at less than 110. Two hours after a meal, levels should be below 140. Over time, A1C in the frail elderly should be kept below 8. The American Diabetes Association has even stricter recommendations, suggesting that A1C be kept below 7, and some endocrinologists recommend values lower than 6.5. The goal should be a balance between the danger of hypoglycemic episodes and the advantage of tight glycemic control. Remember, tighter control has been proven to reduce both complications of diabetes and further morbidity. In the frail elderly, what is the target for A1C? For female residents with diabetes, high-density lipids (HDL) should be maintained at greater than 50. For males with diabetes, HDL should be kept higher than 40. For both males and females, aim for low-density lipids (LDL) levels of less than 100 mg/dL and Triglycerides less than 150. Recent studies have shown that reducing LDL even further, to less than 70 mg/DL, leads to an even greater reduction in acute coronary events. The risks of higher doses of statins are significantly outweighed by the benefits of more vigorous therapy in high-risk patients with a relatively long life expectancy. A healthy blood pressure for residents with diabetes is 120/80. Albumin in the urine (<i>Albuminuria</i>) is a sign of kidney damage: protein that should remain in the body is spilling into the urine. Normal levels are below 20 mg/dL. Levels between 20 and 300 are considered Microalbuminuria, an early sign of kidney disease. Evaluation of the diabetic resident can be greatly facilitated by gathering information from the resident himself/herself. Asking the right questions can reveal issues that might otherwise take considerable time to surface. The information you should gather is roughly categorized on the next few pages. A thorough physical assessment can reveal signs and symptoms that may be associated with diabetes or diabetic co-morbidities. A proper assessment should include baseline labs and vital signs as well as a thorough examination of skin and lower extremities. True or False: Routine physical examination of the diabetic resident should include a thorough examination of the lower extremities. Diabetes, as discussed in Module 2, primarily affects microvascular flow, but it can have an effect on larger vessels both directly and through its arthrosclerosis co-morbidity. ABI is the ratio of blood pressure in the arteries in the ankle divided by the blood pressure in the arm. It is used to predict the severity of peripheral arterial disease (PAD). It can provide a measure of the underlying microvascular support to the lower extremity. Testing can be done by auscultation using arm and leg cuffs, but is usually done with a Doppler device to monitor the pulse while cuffs are inflated over the brachial artery in the arm and the dorsalis pedis artery in the foot. The normal resting ABI is 1 or 1.1 – meaning that BP is about the same in both arteries. If ABI is less than .95, there is significant narrowing of one or more blood vessels in the legs. If less than .8, pain may be present in the foot, leg, or buttock during exercise. If less than .4, symptoms may occur when at rest. If less than .25, severe, limb-threatening PAD is probably present. Check eyes for evidence of cataracts and mouth for evidence of caries or gingivitis. Examine the skin thoroughly, and conduct a skin turgor test to determine presence of dehydration. Examine the perineal area to detect fungal infection or vaginitis. Examine the lower extremities: a basic foot exam should be repeated every 30 days. Take note of any indication of pedal edema, or peripheral capillary filling. Look for evidence of skin atrophy, lesions, inflammation or ulcerations, or evidence of toenail fungus. Evaluations for Charcot’s deformity or neurological damage may also be included. More information about lower extremity care can be found in Unit 6 of this module, Diabetic Wound Care. Initial screening and periodic evaluation of the diabetic resident can help with establishment of baseline values, early detection of problems, and prevention of more severe problems. There are several tests to conduct, but personal interaction is at least as informative, if not more so. Know what questions to ask, and take the time to make careful observations. Although more often associated with Type 1 Diabetes, under some circumstances, Diabetic Ketoacidosis (DKA) can occur in Type 2. If allowed to become severe, it can lead to dangerous or even life-threatening symptoms. This unit defines Diabetes Ketoacidosis and describes early and late signs. Without insulin, glucose is not transported across the cell membranes of muscle and fat cells. Thus, even though the sugar is just on the other side of the membrane, cells sense “starvation” and begin to create glucose from more complex materials. This process is called gluconeogenesis (“newly created glucose”). When stored protein is broken down for fuel, it creates a waste product called Blood Urea Nitrogen (BUN). When stored fat is broken down for fuel, it creates waste products called Ketones, which acidify the blood. The resulting increase of blood acidity is called Ketoacidosis. Type 2 diabetics are less likely to develop ketoacidosis than Type 1 diabetics. Type 2 diabetics usually have some insulin production and so are able to utilize some glucose for fuel. In certain circumstances, however, the Type 2 diabetic may break down fat too rapidly. These circumstances include fever, infection, and poor fluid intake. Diabetic coma can occur after prolonged DKA…. speedy medical attention is imperative. True or False: Too-rapid correction of DKA-related dehydration can have detrimental effects. Diabetic Ketoacidosis (DKA) is a potentially dangerous condition more often associated with Type 1 diabetes than with Type 2. Fever, infection, and dehydration can increase the probability of Diabetic Ketoacidosis in Type 2 diabetics. If undetected and uncorrected, DKA can precipitate dangerous, even life-threatening, effects. Fortunately early signs of DKA are readily observable. A resident newly diagnosed with diabetes will have many questions and concerns, and so will his or her family members. Furthermore, the resident may feel overwhelmed by the life changes that inevitably follow. This unit covers issues around educating the resident and family, and psycho-social issues in residents with diabetes. Proper education can provide many benefits. Residents who understand the implications of their decisions are empowered to make better ones. Co-morbidity and progressive pathology can be reduced, while compliance with medication and monitoring regimens can be improved. Effective education is as much about how you present information as it is about what you present. Hold the interview in a well-lighted, quiet and comfortable space. Avoid having your back to a window or other bright light: doing so makes it hard for the resident to see your face and lips. Use eye contact to maintain a connection. When speaking, speak clearly and distinctly, and teach at a level the resident can understand. Do your best to mitigate language barriers. Watch for non-verbal communication and affect. Provide opportunities for the resident to communicate. Ask open-ended questions, and listen carefully to the responses. Be empathetic, respectful, and non-judgmental. True or False: Educating the diabetic resident is really all about what you have to say. Describe diabetes: its causes, types, and pathophysiology. Review signs and symptoms of hypo- and hyperglycemia. Discuss the primary risk factors such as obesity, lack of exercise, smoking, and hereditary factors. Most importantly, review life-style modifications and risk reduction. Describe the benefits of nutritional and weight management, as well as the benefits of physical activity. Explain the concept of tight glycemic control and its importance. Your goal should be to make sure the resident understands, as much as possible, the degree to which he or she has the responsibility – and the capability – to control the progress of the disease. f the resident will be responsible for self-monitoring, review basics such as skin cleanliness, rotation of the lancet testing site, and periodic recalibration of the device. Make sure the resident understands how often to conduct a blood sugar test. If four times a day, testing should be conducted before each meal and at bedtime. If twice a day, testing should be conducted before breakfast and supper. If once a day, testing should be conducted at different times during the day so that variances throughout a typical day can be detected. Explain corrective measures the resident can take if blood sugar levels fall outside of target range. If below 70, the resident should take some form of sugar followed by more complex carbohydrates. Explain what to do if administering sugar does not work. If above 200, the resident should follow prescribed parameters to readjust the regimen. If above 300, the resident should contact his or her physician to adjust the regimen. If above 400, the resident should contact a physician immediately. Emphasize the importance of keeping a blood sugar diary for caregivers and family to review. Teach the resident what to do when ill, especially in the case of fever or inadequate food or fluid intake. Make sure the resident is aware of the importance of taking regular meals. In addition advise the resident to eat more before taking on unusual levels of activity. Recommend that the resident take a bedtime snack and always keep a packet of sugar available. Describe the frequency and importance of follow-up visits. The resident should be prepared for quarterly A1C tests, urine ketones and protein, and blood pressure. Describe semi-annual tests (BUN/CR&GFR, and urine albumin), and annual tests (LFTs and Lipids, vision, eye exam with dilatation).Encourage annual preventive dental care as well as proper dental hygiene to reduce the risk of decay and infection. The resident should be taught how to inspect the foot daily for trauma, blisters, cuts, rashes, or changes in color. Shoes and clean socks should be worn at all times, and shoes should be checked for foreign objects every time. Feet should be washed and thoroughly dried, and moisturizer should be applied Ð but never between the toes. Exposure to hot water, heating pads or hot water bottles should be avoided, as should adhesive tape and tight or rolled-up hose. Procure quarterly podiatric care of nails and calluses, explain that the resident should never personally apply anything more forceful than emery boards or pumice stones. Advise the resident to avoid crossing his or her legs to prevent circulatory problems, and discourage smoking. Teach residents what to do when ill, especially when they have a fever or are not taking in adequate food and fluids. Explain that they should check their blood glucose levels more frequently, and call their physician to find out if they should make any changes in medication regimens. Explain the importance of proper hydration, especially in the presence of fever. End of Module 3, Unit 3. Generally speaking, there’s a direct relationship between education and compliance. A better-informed patient is better equipped to take an active part in maintaining good habits and proper maintenance. Your role is to provide an atmosphere that nourishes a good relationship with the resident to encourage understanding. We’ve all heard the old saying that “an ounce of prevention is worth a pound of cure.” Nowhere, perhaps, is this saying more applicable than in the case of diabetes. Genetic predisposition certainly is a factor in the development of diabetes, but lifestyle choices play a huge part. This unit describes the “big 3” behaviors that have the biggest influence on the development – and progress – of diabetes. Weight management, exercise, and smoking cessation are the “big 3. Lack of exercise can exacerbate the problem. Exercise allows sugar to cross into muscle and fat, even in the absence of normal amounts of insulin. Weight loss and increased exercise can reverse the problem. Studies have shown that weight loss can reduce the risk of developing diabetes by as much as 58%25. Along with smoking cessation, weight management and routine exercise constitute the “big 3” of diabetes-moderating lifestyle changes. Encourage realistic dietary goals, including a regular diet with enough variety to maintain interest. Consistency is key, in both meal times and amounts of carbohydrates. Residents should also be advised on including appropriate amounts of fiber in the diet. Bear in mind that dietary restrictions may be detrimental to quality of life in a resident with few remaining pleasures. Discuss diet with the resident, family, and care team and strive to achieve a workable balance. Frequent small meals afford the body an opportunity to burn food as it comes in. Medical Nutritional Therapy (MNT) begins with assessing an individual’s nutritional needs and then developing a dietary plan that best meets those needs. For the diabetic, the goals of MNT include attaining and maintaining a healthy body weight, controlling sugar spikes, and normalizing both blood pressure and lipids. MNT plays an important role in diabetes care. A well-planned diet, combined with a regular exercise program, can reduce reliance on medications as well as reduce the risk of diabetic co-morbidity. You may remember from earlier units that glucose is the body’s primary source of fuel. Glucose can be ingested directly; the body can also break down (metabolize) any form of food to use as fuel. Carbohydrate, protein, and fat can all be converted into glucose. The medical term for this process is Gluconeogenesis, from the Latin words for glucose, new, and create. Frequent small meals afford the body an opportunity to burn the food as it comes in instead of being overwhelmed and having to deal with higher levels of fuel than needed at any particular time. True or False: Blood sugar can be better regulated by eating large meals at 6-hour intervals. A carbohydrate is either a starch or a sugar. Carbohydrates are made up of carbon, hydrogen and oxygen and are easily converted into glucose. Fat is also made up of carbon, hydrogen, and oxygen, but takes more time to break down into glucose. The body will consume energy from carbohydrates first. Then, if additional fuel is needed, the body will begin to burn fat. The acid byproducts of fat breakdown are called ketones. Excessive ketone levels lead to ketoacidosis, a potentially dangerous condition. For more information on ketoacidosis, see unit 2 of this module. Protein is made up of carbon, hydrogen, oxygen, and nitrogen. When the body resorts to using protein for fuel, it leaves nitrogen and can ultimately affect the Blood Urea Nitrogen (BUN) level. Daily intake of carbohydrates should equal 45% to 65% of total calories. Fats are usually stored, and if not utilized will gradually build up in the storage areas of the body. Some fat is necessary in the diet but intake should be kept at less than 30%25 of total daily calories. Less than 10%25 of total daily calories should come from saturated fats. Protein is composed of amino acids, the essential “building blocks of life.” Protein intake should be about 10% to 20% of total daily calories. The consistent carbohydrate diet prevents post-prandial glucose spikes. In the past, it was thought that diabetics should restrict all simple sugars. In recent years, the focus has shifted to emphasize the total amount of carbohydrate in a meal rather than the source of the carbohydrate. The goal is to maintain a diet that has a consistent amount of carbohydrates from meal to meal and from day to day. The diet can include a variety of foods and should be tailored to the resident’s likes and dislikes. Desserts can be worked into a consistent carbohydrate meal plane. A “glycemic index” provides a measure of the relative impact a specific food will have on the blood glucose level. Foods that make glucose more readily available, such as simple sugars, have a higher glycemic index. The consistent carbohydrate diet prevents post-prandial (after meal) glucose spikes, thus reducing the risk of damage to the endothelial lining of the body’s capillaries. When considering the dietary needs of the diabetic resident, be aware of sodium as well. Remember that a frequent co-morbidity with diabetes is hypertension, and that sodium can impact cell membrane integrity. Foods that are high in sodium include many canned, processed and fast foods; pickles and olives; most snack foods; and frozen or packaged dinners. Sodium-heavy condiments such as soy sauce should be used sparingly. The so-called ADA diet is no longer being used and the American Diabetes Association no longer endorses any single meal plan or specified percentages of macronutrients. Certain dietary restrictions, such as the absolute elimination of sweets, are also no longer considered appropriate. Keep in mind that intake and exercise are both important when addressing weight issues in the diabetic resident. Which of the following items should be altogether excluded from the diabetic resident’s diet? An overly complex or restrictive diet is not likely to succeed. When formulating dietary recommendations, take into account the resident’s likes and dislikes, as well as the resident’s need for some autonomy. Some residents feel that mealtime is one of their last remaining pleasures. Others have lost interest in food and struggle just to maintain adequate caloric intake. In either case, a diet that is overly complex or restrictive is not likely to succeed. Help the resident to understand the risks and benefits of his or her dietary choices. Whenever possible, include the family in decision-making and help them also to understand the resident’s needs. Everyone, regardless of medical condition, benefits from regular exercise. For the diabetic, the benefits of exercise are even more pronounced. Exercise can reduce the health risks of diabetes, and may even prevent or delay the onset of the disease. Regular exercise improves metabolism and insulin effectiveness, reducing blood glucose levels. Coupled with a sensible diet, exercise can help reduce weight as well, which can be especially beneficial because excessive body fat inhibits the effectiveness of insulin. Exercise can also reduce the risk of diabetic co-morbidity, particularly atherosclerosis, by reducing blood cholesterol and lipid levels. Furthermore, exercise helps reduce stress and improves the feeling of well-being. For the diabetic resident, it is important to develop an exercise regimen with input from the care team. Discuss possible programs with the resident’s physician and/or rehabilitation team. Talk with the resident about his or her exercise preferences and encourage the resident to exercise with others who share those preferences. Any exercise routine should begin with a warm-up and stretching period and end with a cool-down. Keep duration between 20 and 45 minutes, five or six days per week. True or False: Regular exercise improves insulin effectiveness, even after the period of exercise. Some precautions are wise. Ensure that the resident wears proper footwear. The resident should wear an alert device, if applicable, especially if exercising alone. Monitor blood glucose levels initially, both before and after exercise. If glucose is above 300 without ketosis, or above 250 with ketosis, exercise should be avoided. If glucose is below 100, add carbohydrates prior to exercise (or decrease diabetic medications if appropriate). Keep carbohydrates or sugar nearby, and monitor hydration. Avoid extreme temperatures as well. Smoking exacerbates complications of diabetes. Smoking, even without diabetes, affects circulation. As such, smoking exacerbates micro- and macrovascular complications of diabetes. Studies have also shown that smoking can contribute to insulin resistance. Smoking increases the risks of diabetic co-morbidities such as heart disease, stroke, and damage to the nerves, kidneys, and retinas. For those who are quitting, concerns about weight gain are common. These concerns are especially significant for diabetics who are also trying to manage their weight. Be sure to supply the resident with healthful substitute behaviors and foods. Diet and exercise play an important role in managing diabetes. A well-planned diet can reduce extreme changes in blood sugar and thereby reduce the risks associated with diabetes. Extreme restrictions, however, can have a negative effect, and such restrictions are no longer considered necessary. On the contrary, variation in the diet should be encouraged. As with diet, exercise can have beneficial effects on disease management. An exercise plan should take into account the resident’s preferences, and should be designed with safety and consistency in mind. Finally, if the resident smokes, explain the additional health risks of smoking and help develop a smoking cessation plan. Although diabetes is linked to multiple co-morbidities, there is much that can be done to prevent or diminish its effects. Good practice covers a wide range of interventions including screenings, systemic approaches, and treatments targeted at specific issues. This unit provides guidelines for assessing and monitoring the resident’s condition and for prevention and/or treatment of various co-morbidities. Upon or shortly following admission, the following tests should be performed to obtain baseline values. Which of the following should be performed more often than twice a year? Diabetic retinopathy is the leading cause of blindness among Americans. Diabetic retinopathy is the leading cause of blindness among Americans. Fortunately, vigorous glucose control can reduce the severity of retinopathy as well as delay its onset. Blood pressure control is preventive as well, as is glaucoma control. A person with diabetes is nearly twice as likely to develop glaucoma as a person without diabetes. If blood vessels begin to leak or proliferate, surgical intervention may be recommended. Laser photocoagulation may be used to seal leaking vessels or to shrink or destroy abnormal ones. Vitrectomy may be used to remove blood in the eye’s vitreous gel. Cardiovascular diseases are a major cause of mortality in residents with diabetes. As with so many diabetic co-morbidities, diligent blood pressure management is key. Aim for blood pressure of 120/80. Address signs and symptoms of Congestive Heart Failure (CHF) or angina quickly: watch for increased fluid retention, chest pain, and/or shortness of breath (dyspnea) with activity. Diabetic patients may be prescribed low-dosage aspirin therapy: there is no evidence that aspirin use increases the risk of diabetic retinopathy. Statins, ACE inhibitors, Angiotensin Receptor Blockers (ARBs), and calcium channel blockers may be prescribed as well, unless otherwise contraindicated. ACE inhibitors and ARBs have both been shown to be kidney protective. Note however that ACE inhibitors may increase potassium retention, which may be detrimental in residents with end-stage renal disease. Beta blockers and thiazide diuretics may cause an increase in the incidence of diabetes. Also note that African Americans tend to be less responsive to Beta blockers and ACE inhibitors. As mentioned previously, ACE inhibitors and ARBs have been shown to protect kidney function and reduce proteinuria. Maintaining a reduced-salt diet may also be beneficial. Vigorous blood glucose control is again especially important. Early referral to a nephrologist has been shown to reduce cost and improve quality of care, and should be considered when glomerular filtration rate<i> </i>(GFR) approaches 60. Protein restriction is usually not required unless the resident is on dialysis. Residents should be monitored periodically for peripheral neuropathy. Annual screening should include sensation measurement using monofilament (such as Semmes-Weinstein 5.07), or a safety pin if monofilament is not available. The resident should be questioned about sensation (sharp or dull) as well as vibratory sense. Address issues of biomechanics and gait with appropriate rehabilitation. Neuropathic pain may be addressed with medications such as Cymbalta or Lyrica. If appropriate, ask about any related sexual dysfunction. True or False: A test for peripheral neuropathy need only be performed upon admission. Diabetics are particularly susceptible to damage to the feet. Diabetics are particularly susceptible to damage to the feet, due to the disease’s circulatory and neurological effects. Residents should be monitored for fungal infections and wounds on a regular basis. Residents should be fitted annually for walking shoes that cushion and protect the feet. Such shoes may also help redistribute weight and address specific deformities such as bunions, hammertoe, or Charcot’s foot. Medicare benefits may cover the cost of such shoes. A later unit provides more information on foot and wound care. Diabetes can have wide ranging, damaging effects. Tight glycemic control can prevent or reduce many of these effects. Regular assessment/screening can also be very beneficial. If co-morbidities are present, specific interventions can dramatically improve the resident’s prognosis and quality of life. Off all the co-morbidities associated with diabetes, foot ulcers are among the most common and tragic. Approximately 15%25 of residents with diabetes will develop foot ulcers and 14-24%25 of those will eventually require amputation. Diabetic foot ulcers require different treatment than other types of foot ulcers. Therefore, it’s imperative that you learn to distinguish their unique characteristics. This unit provides descriptions of diabetic and other types of ulcers, assessment techniques, and wound care therapies. Diabetes impairs the body’s ability to heal itself. A diabetic foot ulcer, also known as a Neuropathic Ulcer, is most frequently caused by trauma such as a foreign body in the shoe or ill-fitting shoes. Such trauma is often undetected by the diabetic due to peripheral neuropathy associated with diabetes. A wound that has not healed in 4 weeks is considered chronic. The wound remains in inflammatory phase and healing becomes impaired. In addition, the micro- and macro-vascular dysfunction associated with diabetes also impairs the body’s ability to heal itself. Healing is further impeded by reduced collagen synthesis, impaired wound contraction and delayed epidermal migration. Further, since the diabetic is more susceptible to infection, an undetected and untreated wound can become gangrenous. Cellulitis and/or osteomyelitis may develop even without a break in the skin. If there is any evidence of lower extremity trauma, the resident should be monitored for infection. As stated above, diabetic ulcers are often precipitated by trauma. They are usually painless, have an even wound border and are relatively deep. They are predominantly located on the plantar (bottom) surface of the foot, over the metatarsal heads, or under the heel. Venous stasis ulcers usually present with a history of edema, weeping atrophic and indurated (abnormally hardened) skin. They can also be associated with prior venous surgery. They present with a ragged border on a background that is erythematous (reddened), hyper-pigmented, and atrophic. Pressure ulcers are predominantly on the boney prominences of the ankle and dorsal aspects of the heel. If bone is exposed it should be considered infected until proved otherwise. If you suspect that the resident does have a diabetic foot ulcer, you should carefully assess for undermining, which must be addressed if the wound is to heal. Monitor diligently for bacterial colonization. Curettage cultures are recommended if inflammation, discharge or purulence is detected. If bone is exposed in a diabetic lesion it should be considered infected until proved otherwise by scan or x-ray. Classification of the ulcer is most often based on the Wagner Scale. It is based on three features: depth of the ulcer, degree of infection, and extent of gangrene (if present). A monofilament test, also known as a Semmes Weinstein Test, is an easy method of detecting a loss of peripheral nerve sensation. Place the resident in a supine or sitting position with shoes and socks removed. Touch the monofilament to the skin on the resident’s arm or hand to demonstrate what the touch feels like. 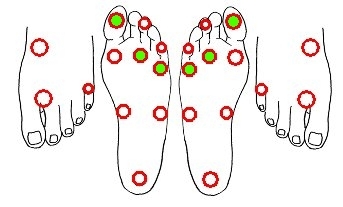 Instruct the resident to close his or her eyes, and to point the toes straight up. Test each time three times, randomly including a fake touch. Vary the time between touches. Each time, ask the resident if he/she felt the touch. Figure 3.6.1 illustrates the locations for testing. Do not test over ulcerated, callused, scarred, or necrotic tissue. Do not slide the monofilament over the skin. Charcot’s foot is a deformity associated with peripheral neuropathy. The bones of the foot become weak, but due to lack of sensation the resident continues to walk. Eventually, the bones fracture and the foot becomes deformed, taking on a characteristic “rocker bottom” shape: rounded like the bottom of a rocking chair. Early detection is key to successful treatment. The primary intervention is pressure relief at all times; this is known as “off-loading.” The goal of off-loading is to reduce mechanical pressure or stress to the ulcer, and ranges from casting the foot to bed rest. Interventions include surgical shoes, half shoes, and/or felted foam dressing, often with the use of crutches. Any device should be diligently monitored to ensure that it is not causing additional trauma.<b> </b> Removal of moribund or necrotic tissue has been shown to encourage re-activation of the proliferative phase of wound healing. Soft tissue and bone must also be debrided if involved in infection. True or False? Debridement can encourage re-activation of the proliferative phase of wound healing. Utilize appropriate moist wound dressings. Dressings may also be useful in preventing trauma. The choice of dressing depends on the need for secretion absorption and conformability. Diabetic foot wounds require a clinical rather than a cultural diagnosis since virtually all such wounds are colonized. If there is evidence of purulence, erythema, warmth, tenderness or induration, infection is likely. Educate the resident about the dangers of foot wounds. Half of those who have had a diabetic foot wound will have another wound at the same or at a different site on the foot within two to five years. Foot protection is essential: even if the resident is in a wheelchair the feet should be covered. Those who are ambulatory should be advised to avoid walking barefoot. Provide accommodating footwear that addresses deformities and pressure points, particularly plantar pressure. Specially constructed insoles contoured to the foot help distribute weight. Extra height within the shoe can reduce pressure on the dorsum, while extra width can prevent pressure between the toes. Frequent podiatric attention can provide nail care and monitor for trauma. If associated with ischemic disease, revascularization may be appropriate. If there is inadequate circulatory support, the healing process can halt, causing the wound to remain in the inflammatory phase. True or False? In the diabetic resident, a wound might remain in the inflammatory phase. Note that scar tissue is about 80% as strong as original tissue. Because they are susceptible to neuropathy and vascular disease, diabetics are also susceptible to loss of sensation in the feet. Loss of sensation can mean insensitivity to trauma and result in wounds that go undetected. Diabetic foot wounds may heal slowly or not at all for the same reasons that they can occur in the first place: neuropathy and vascular impairment. The primary preventive measures are relief of uneven pressure, and monitoring to detect trauma. Relief of pressure is also a primary intervention, as is debridement. There are four distinct phases of healing, but due to nerve and vessel damage, the diabetic’s wound may remain in inflammatory phase and become chronic. Periodic evaluation should include testing for loss of sensation and visual inspection for signs of trauma, including Charcot’s deformity. We know that diabetes is the result of insufficient production of insulin and/or the inability of the body to utilize insulin. But what is insulin exactly and how does it work? This unit provides information about insulin’s production and action in the body along with a review of the concept of tight glycemic control. The word Insulin has its origins in the location in the body where insulin is produced. The cells that produce insulin are in the “Islets of Langerhans” in the pancreas. The Latin word for island is “insula.” The specific cells in the pancreas that produce the insulin are called beta cells. When food is ingested, much of it is converted into glucose, which makes its way into the bloodstream. Normally, when the kidneys and pancreas sense increased glucose in the blood, the pancreas automatically releases insulin. The insulin helps the body’s cells absorb glucose from the blood and use it as fuel. Insulin is produced primarily in which organ(s) of the body? Insulin also controls the liver’s function of releasing extra glucose when the body is not ingesting food, or storing glucose when the body has ingested too much food. When the pancreas detects insufficient blood glucose, it secretes glucagon to stimulate the liver to begin the process of releasing stored glucose. Glucagon may be thought of as ‘reverse insulin.’ Glucagon is produced by the pancreas’ alpha cells. Tight glycemic control means keeping blood glucose neither too high nor too low. There is consensus that lowering a resident’s A1C to normal levels has a direct impact on reducing microvascular and neuropathic complications of diabetes including MI, CV disease, stroke, and renal failure. Tight glycemic control is defined as keeping blood glucose levels routinely within non-damaging concentrations – <b>neither too high nor too low</b>. For residents in the long-term care setting, the target is A1C of about 8.0. True or False? Tight glycemic control is defined as keeping blood sugar levels from getting too high. Originally insulin was extracted from pig and beef pancreas. Insulin is now manufactured, utilizing genetic engineering to create the human form of the hormone. Insulin can control but cannot cure diabetes. Because insulin is comprised of protein, it cannot be taken orally or the digestive system would destroy it before it could reach the bloodstream. Insulin must be given by injection. Insulin is at the root of diabetes: either the pancreas does not produce enough insulin, or the body cannot effectively use the insulin available, or both. Insulin is therefore at the root of diabetes treatment. It must be given by injection, and is able only to control diabetes, not cure it. Evidence suggests that tight glycemic control is beneficial in reducing the risk of co-morbidity. End of Module 4, Unit 1. Insulin must be properly stored for safety and effectiveness. Insulin must also be properly administered, at the right time and with the right procedures. This unit describes the procedures for storing and administering insulin, including newer administration devices. It also describes Basal Therapy, and Bolus Therapy (including Sliding Scale). Insulin should be kept refrigerated until opened. Insulin may be kept at room temperature (below 80 degrees Fahrenheit) for several days, and may be more comfortable injected at that temperature. However, insulin is essentially protein dissolved in water, like broth, and even with preservatives it can spoil over time. Insulin should never be frozen; on thawing it will separate and clump making it unusable. It should never be kept in temperatures higher than 80 degrees or exposed to prolonged sunlight. True or False? Insulin may be kept frozen until ready for use. Gently mix the insulin by rolling gently between the palms. Confirm the type of insulin and the expiration date. Verify that the label on the bottle matches the label on the box in which it is stored. A refrigerated vial may be permitted to come to room temperature, or may be held between the hands to warm slightly. For many types of insulin, gently mix by rolling between the palms several times and/or flipping the container up and down several times. Never shake the container vigorously, as this may introduce too many air bubbles into the solution. Discard insulin if it appears discolored or lumpy, or if the expiration date has passed. Short-acting insulins and Lantus must be clear. Wipe the vial with alcohol and allow it to air dry. Draw air into the syringe and inject into vial. Withdraw the appropriate dose. Draw up Regular or Humalog first if mixing with other insulins. Never mix insulins from different manufacturers, and never mix Lantus with any other insulin. When injecting, avoid bony areas or joints. Recommended sites include the abdomen, thigh, buttocks, hip, or arm. Pinch the skin and inject the needle. For normal- to overweight residents, inject at a 90-degree angle. For thin or frail residents, you may wish to inject at a 45-degree angle to avoid injecting into muscle. Avoid areas of rash or infection, and rotate sites to prevent tissue damage. After injection, remove the needle and lightly press down on the site, but do not rub. Some insulins are now available in a pen injector, consisting of a syringe and a cartridge of insulin in a single convenient package. Dosage is controlled by a dial that limits the movement of the plunger. Also available is an insulin pump that uses computer chip technology and battery power to inject insulin from a reservoir. Several types of insulin can be used. The pump injects insulin via a catheter inserted into the skin. It can be worn continuously attached to a belt, bra or pouch; the catheter should be capped during bathing. It delivers insulin at a slow continuous rate, but can also deliver additional insulin as needed. The pump is rarely used in a long-term care setting as it is more appropriate for those who are living independently, are highly motivated, and are able to manage complex regimens. Which of the following is NOT a current device for administering insulin? Basal therapy is becoming more common as the standard of care. The goal of Basal therapy is to keep the blood glucose level as close to normal as possible to prevent cell damage. Basal therapy consists of one injection a day, usually in the evening. This therapy suppresses glucose levels at all times, and can be supplemented with rapid acting insulin and/or oral medications if needed. It works best with those who can take frequent, small meals to keep some glucose available at all times and prevent a slip into hypoglycemia. Basal therapy insulin cannot be given IV and cannot be mixed with other insulin. In Bolus therapy, short-acting insulin is administered as needed, usually around meal times. It requires frequent monitoring and multiple doses. Bolus therapy is commonly administered 15 minutes prior to meals, and may result in hypoglycemia if there is a delay before eating or food intake is low. For residents, therefore, it may be better to evaluate food consumption and then administer Bolus therapy, as it can safely be given up to 30 minutes after the meal. Sliding Scale treatment involves using intermediate-acting insulin twice daily and supplementing with short-acting insulin as needed. This type of treatment is now thought to be less effective because it addresses hyperglycemia only after it has occurred, increasing the risk of cell damage. Table 4.2.1 shows an example of a typical Sliding Scale treatment. If a resident has been referred from a hospital, the hospital may have been using Sliding Scale treatment to address the rapid fluctuations in glucose levels associated with acute illness. It’s a good idea to check the resident’s prior history to see if other therapies were effective prior to hospitalization. True or False? Sliding scale therapy is now thought to be less effective because it is used only after hyperglycemia has occurred. End of Module 4, Unit 2. Whenever insulin is used, it must be stored and administered properly. Safety precautions include storing at the proper temperature, disposing of expired insulin, injecting into fatty tissue, and rotating injection sites. Recent research indicates that preventing blood sugar peaks is more effective at reducing cell damage than former therapies that addressed blood sugar peaks only after they occurred. Insulin is usually classified by the amount of time it takes to begin acting and/or the duration of its action. The range of classifications available makes it possible to choose the one that best meets the resident’s needs. This unit describes each classification and provides a few examples of brands in each category. Rapid Acting insulin has the fastest onset of all categories. It also has the shortest duration. It should be administered immediately prior to, or within 30 minutes after, meals or snacks. Benefits: limits postprandial hyperglycemic peaks; reduces late postprandial hypoglycemia; can be administered up to ½ hour after eating to adjust for intake. Risks: can induce hypoglycemia if the resident’s intake is unreliable; may last up to 12 hours despite “rapid acting” designation. Examples: Humalog (Eli Lilly); NovoLog (Novo Nordisk); Aspidra (Sanofi-Aventis). Storage: 30 days – open vial – outside frig. 90 days if refrigerated. True or False? Rapid acting insulin can be administered up to 30 minutes after a meal has been taken. Short Acting (also known as Regular) insulin falls between Rapid Acting and Intermediate acting in terms of onset and duration. Onset is between ½ and 1 hour; peak is at 2½ to 5 hours; duration is 8 to 12 hours. Benefits: Like rapid-acting insulin, can be injected shortly before meals to control postprandial hyperglycemia. Risks: As with Rapid Acting, care should be taken to monitor residents whose intake is unpredictable. Examples: Novolin R (Novo Nordisk); Relion R (Nove Nordisk exclusively for Walmart); Humulin R (Eli Lilly). Lantus (Sanofi) is considered a short-to-long-acting insulin due to its prolonged absorption. Intermediate Acting insulin is also known as NPH insulin because it is created by adding Neutral Protamine Hagedorn to prolong the insulin’s effect. Onset occurs within 1 to 1½ hours, with peak in 4 to 12 hours and duration up to 24 hours. Prior to administration, the vial should be rotated gently to re-suspend any sediment on the floor of the vial, so that the mixture has an evenly cloudy appearance. Benefits: Can be combined with regular insulin and rapid acting insulin analogs Risks: Absorption is variable with each individual. Care should be taken to monitor effect until absorption rate is known. Examples: Novolin N (Novo Nordisk); Humulin N (Eli Lilly); Lente (Eli Lilly). Lantus (Sanofi) is considered a short-to-long-acting insulin due to its prolonged absorption. True or False? Intermediate acting insulin may be combined with regular or rapid acting insulin analogs. Long Acting Insulins are said to mimic normal pancreatic basal insulin secretion, smoothing out glucose peaks and troughs. They may remain effective for up to 24 hours. Benefits: Once a day administration; reproducible effects; reduced risk of nocturnal hypoglycemia. Risks: Hypoglycemia (with associated symptoms- sweaty hands, slurred speech, flushed skin etc. ); lypodystrophy, swelling and redness at the injection site; vision changes. Some studies debate the effectiveness of long-acting insulins. Examples: Lantus (Sanofi-Aventis; Levemir (Novo Nordisk); Ultralente (Eli Lilly). Pre-mixed insulin analogs combine rapid and intermediate acting insulin to bridge the gap between Bolus and Basal approaches to blood sugar management. Benefits: Convenient; provides multiple therapeutic onsets and peaks. Risks: May be inappropriate for individuals with unpredictable intake. Examples: Humulin 70/30 (Eli Lilly); Novolin 70/30 (Novo Nordisk); Humalog Mix 75/25 (Eli Lilly); NovoLog 70/30 (Novo Nordisk); Humulin 50/50 (Eli Lilly). For more information on these examples, see the Tips drawer. True or False? Pre-mixed analogs may be inappropriate for individuals with unpredictable intake. End of Module 4, Unit 3. Insulin is classified by the time of onset, the time of peak effectiveness, and the duration. Many classifications are available, and some are well suited to the diabetic resident in Long Term Care. Predictability of intake is a key factor in selection of a particular class. As always the goal is to prevent significant fluctuation of blood sugar, which should not be permitted to become too high nor too low. As discussed in unit 1 of this module, the action of digestion would destroy insulin’s effectiveness if taken orally. There are, however, other types of diabetes medications that can be ingested. These oral diabetes medications fall into five categories: Biguanides, Insulin Secretagogues, Thiazolidinediones (TZDs), Alpha-glucosides Inhibitors, and Dipeptidyl Peptidase-4 (DPP4) Inhibitors. Research into medications to control diabetes continues, with many recent developments as well as some promising ones still on the horizon. This unit provides information about the categories of oral medications and their actions in the body, as well as an overview of newer medications. Biguanides reduce the amount of glucose produced by the liver. All forms of Metformin should be taken with the largest meal of the day to avoid GI upset. Nausea, diarrhea, or loss of appetite may be expected when starting a regimen. It is best, therefore, to start with a low dosage and increase gradually Caution the resident about these potential side effects. Biguanides should not be used in males with Creatinine levels about 1.5, or in females with Creatinine above 1.4. Residents with CHF requiring prescription medication would not be appropriate candidates for Biguanides treatment, nor are residents who are experiencing metabolic acidosis, dehydration, sepsis, or are undergoing radiological study. Liver failure is also a contraindication. Lactic acidosis can occur in residents with impaired renal function, hepatic or CV insufficiency, have dehydration potential, or are of advanced age. This issue is rare but should be considered especially during any acute illness. Do not give Biguanides if there is a history of alcohol abuse. What is the primary action of the class of medications known as Biguanides? Insulin Secretagogues increase the amount of insulin secreted by the pancreas. There have been three generations of Sulfonylureas since their introduction in the US in 1955. The first generation is rarely used now due to their potential for inducing hypoglycemia and their link with increased CV disease mortality rates. The second-generation Sulfonylureas have fewer side effects but are more expensive. They have a shorter half-life, can be combined with other forms of diabetes medications, and have fewer issues with drug-drug interactions. Third generation drugs in this class may reduce insulin resistance somewhat and are also less likely to cause hypoglycemia. Most medications in this class should be taken with food and used with caution in the elderly. Like Sulfonylureas, Meglitinides are Insulin Secretagogues. Unlike Sulfonylureas, Meglitinides are rapidly absorbed and metabolized, like rapid acting insulin. Therefore they should not be used in combination with rapid acting insulin: the combination has been shown to cause diabetic ketoacidosis. They should be taken 15-30 minutes before meals, and not taken if the meal is skipped. They may cause weight gain, headache, dyspepsia, constipation, diarrhea, or anorexia. They have not been shown to effect lipid metabolism. Examples include Prandin (Repaglinide, Novo Nordisk) and Starlix (Nateglinide, Starlix). True or False? The class of Insulin Secretagogues called Meglitinides act quickly and should not be combined with rapid acting insulin. TZDs increase insulin sensitivity and muscle uptake of insulin. hiazolidinediones (TZDs) act in the pancreas, but do not stimulate insulin secretion. Instead, they increase insulin sensitivity and muscle uptake of insulin, while reducing insulin resistance and hepatic gluconeogenesis. They bind to perixisome proliferator-activated receptors (PPARs). TZDs may be taken with or without food. They can be combined with Biguanides or Insulin Secretagogues, and do not cause hypoglycemia in monotherapy. TZDs are relatively expensive. They have been shown to increase intravascular volume and one brand (Avandia) has been linked to CV disease-related mortality. Therefore, they should not be used in residents with CHF. They may cause weight gain, anemia, myalgia, headache and fatigue. Use of TZDs requires regular liver enzyme monitoring. Examples include Actos (Pioglitazone, Takeda Pharmaceuticals); Avandia (Rosiglitazone, GlaxoSmithKline). Alpha-glucosides Inhibitors delay absorption and metabolism of carbohydrates. Alpha-glucosides Inhibitors act in the GI tract to delay absorption and metabolism of carbohydrates, by inhibiting enzymes in the small intestines and pancreas. They should be taken with the first bite of the largest meal of the day, and in order to be effective, require a diet that is at least 50%25 carbohydrate. They do not cause hypoglycemia when used in monotherapy, and should not be used in combination with Metformin. They should also not be used for residents with a history of diabetic ketoacidosis; in cases of hypoglycemia, the action of remedial carbohydrates will be delayed. They can cause gas, bloating, and diarrhea so they should not be prescribed if the resident has IBS. Dose-related side effects do lessen with time. Examples include Precose (Acarbose, Bayer); Glyset (Miglitol, Pfizer). True or False? Alpha-glucosides Inhibitors delay absorption of carbohydrates so they should not be used in residents with a history of hypoglycemia. DPP4 Inhibitors protect insulin from the enzymes that deactivate it. Dipeptidyl Peptidase-4 (DPP4) is an enzyme occurring in the body that deactivates insulin. DPP4 Inhibitors act to protect insulin from this enzyme. Their primary sites of action are the pancreas and the liver, where they also regulate over-production of glucose. They are incretin mimetic: that is, they mimic the action of natural hormones (incretins) that reduce blood sugar. They are expensive, but may be used in diabetics with hepatic dysfunction. Because they are excreted by the kidneys, kidney function monitoring is recommended. Januvia (Sitagliptin, Merck) is an example of a DPP4 Inhibitor. In early 2010, Novo Nordisk began Phase 1 trials of an insulin tablet. Using a new technology developed by Emisphere to micro-encapsulate the insulin, the drug is designed to pass through the digestive system to be absorbed in the duodenum. Another form of oral insulin in development is a sublingual spray called Oral-Lyn, made by Generex. As of spring, 2010, the drug was available in the US only through the FDA’s Expanded Access Treatment Investigational New Drug (IND) program. Incretin mimetics stimulate insulin secretion only when blood sugar is high. Their action restores the first phase insulin response, an activity of the insulin-producing cells in the pancreas that may be lost in Type 2 diabetics. They also act by suppressing inappropriately elevated glucagon secretion and by slowing gastric emptying. In clinical trials, one form (Byetta) showed that residents in long-term trials also experienced reductions in weight. Byetta is a GLP-1 analog that should be taken within an hour prior to morning and evening meals. It peaks in about 2 hours and has a duration of about 10 hours. It requires the same refrigeration as insulin. Symlin is an Amylin analog that should be taken immediately prior to each major meal. It peaks within about 20 minutes and has a 3-hour duration. Refrigration parameters are similar to those of insulin, but Symlin can be kept at room temperature for only 28 days (contrasted to 30 days for insulin). Which of the following statements is NOT true of Incretin Mimetics? They stimulate insulin secretion only when blood sugar is high. They restore the action of insulin-producing cells in the pancreas. They suppress inappropriately elevated glucagon secretion. They help muscle cells absorb glucose. Although not a medication, there is one additional new treatment that should be mentioned here: Islet Transplantation. This involves injecting Islet cells into a portal vein, from which point the cells will lodge in the liver and secrete insulin. Studies show some promise, although efficacy seems to diminish over time. Insulin by injection is not the only choice for treating diabetes. There are various other medications that act by stimulating insulin production, increasing the body’s ability to utilize insulin, reducing glucose generation, and/or by mimicking the action of insulin-helper hormones. In addition some forms of oral insulin are currently in research phase and may increase compliance by reducing reliance on injection. Finally, research continues on the possibility of using Islet Transplantation to restore impaired insulin production. Much like a hiking trail needing a guide, the nursing care of any individual requires a systematic approach to cover all of the aspects of care. Care plans are formed using the nursing process to gather subjective and objective data about the individual. This information is organized into a systematic pattern to identify the nursing interventions, expected outcomes and goals. The diabetic individual hasmultiple systems involved in their disease process requiring an effective analytical approach. A diabetic care plan will provide the guidance necessary to successfully provide care to each individual. Note: This entire unit can be downloaded and printed so that you can keep it and refer to it again. Click here to download it in Portable Document Format (requires the free Adobe® Acrobat® Reader. Define the unique aspects of the diabetes nursing care plan which require systematic focus. The role of the nurse will include observation, assessment, prevention and treatment. Nursing care requirements for the diabetic can be varied and challenging. The role of the nurse will include observation, assessment, prevention and treatment. Diabetic compliance is a factor which requires actively listening to the patient, innovation and resourcefulness. Diabetes is not one disease, but many. It is now being discussed as not a single disease but as a metabolic syndrome. The devastating effects on almost every organ are what truly make this disease have one of the highest co-morbidities. Diabetes affects many parts of the body and if left untreated or are undertreated often lead to serious complication such as blindness, kidney damage, and lower-limb amputations. Most people with diabetes die from cardiovascular conditions exacerbated by the disease. The first step in treatment is for the nurse to be aware of the wide range of co-morbidities associated with diabetes. More information on Diabetic Co-Morbidities can be found in Unit 5 of Module 3. What is the first step in treating diabetes? In caring for those with diabetes, pay particular attention to problems associated with its complications. Of course the potential exists for issues with glycemic control resulting in hyper or hypoglycemia. Observe, document, and if required, treat issues such as fluid intake, dietary compliance, oral care, and skin issues — particularly foot care, falls and depression. Simple root cause analysis of a situation can often prevent a complication. Take for instance the patient who tells the dietician all they want to eat is milk shakes. When the time is taken to interview the patient further and the right questions are asked; it is determined the patient is having pain with chewing. A simple dental appointment can resolve the issue and put the diabetic patient back on a healthier eating program. Recognizing the potential for falls from either low fluid intake or foot problems enables the nurse to make a preventative plan of care. A proactive approach reduces the risk of multiple complications which in turn provides a higher quality of life and reduction in incidents and accidents. Avoiding either hypo- or hyperglycemia is vital to managing the diabetic. Be aware of the signs and symptoms of both, along with the protocols and procedures for treatment. Doing so will help reduce the risk of more serious adverse effects. These signs and symptoms were discussed thoroughly in Unit 4 of Module 2. For your convenience, they are reviewed in the Tip drawer here as well. Your facility will have policies and procedures for managing hypo- and hyperglycemia. Some may include calling response teams within the facility or utilizing a 911 emergency response system. Familiarize yourself with your facility’s protocols. Hypoglycemia is a common complication of diabetes management. Chronic hyperglycemia is associated with multiple organ dysfunction and failure. Determine if blood sugar is below 70 mg/dL. If the resident is able to swallow, administer an oral form of rapidly absorbed glucose, such as 4 oz of juice or 5-6 oz of soda. If the resident is responsive but unable to swallow, administer oral glucose paste, intramuscular glucagon, or IV 50%25 dextrose, and place resident in a comfortable safe place. Monitor vital signs. If the resident is unresponsive, call for help in accordance with the resident’s advance directives. Remain with the resident. If blood sugar remains below 70 mg/dl, repeat remedial steps and recheck blood glucose in 15 minutes. Certain other conditions and treatments increase the risks of hyperglycemia. These include calcium channel blockers used to treat high blood pressure, angina, chest pain, and some arrhythmias. Beta-adrenergic agonists, used to treat asthma, bronchitis, emphysema, and other airway disorders, also increase hyperglycemia risk. In addition, risk of hyperglycemia increases if the resident is using opiates to treat acute or chronic pain. As part of the initial assessment, the physician will help identify residents who have, or are at risk for, diabetes. Pertinent tests may be ordered at that time, as well as during a follow-up period (generally one week). Once findings have been evaluated, an initial care plan will be created. The physician should address complications such as dyslipidemia, coronary artery disease, neuropathy, and nephropathy based on the individual’s overall condition, prognosis, function, and treatment preference. The care plan may include treatment of underlying conditions as well as lifestyle modifications. The plan should be consistent with applicable guidelines. For example, insulin may be indicated when diet, exercise, and oral medication fail to adequately control blood glucose levels. Follow-up and treatment goals should remain fluid with care planning, and should reflect the input of the resident regarding their personal preferences. The purpose of obtaining a blood sample is to determine the resident’s blood glucose. First, verify the physician’s order and the resident’s care plan. Assemble the required equipment and supplies, and ensure they are working properly by performing any calibrations or checks as instructed by the device’s manufacturer. For the resident on oral medication(s) who is well controlled: monitor blood glucose levels at least twice weekly (or more frequently if there is a change in drugs or drug dosages); monitor A1C on admission (if no results from a previous test are available) or when diabetes is diagnosed and every 3 to 6 months thereafter. For the resident receiving insulin who is well controlled: monitor blood glucose levels twice a day if on insulin (for example, before breakfast and lunch and as necessary); monitor 3 to 4 times a day if on intensive insulin therapy or sliding-scale insulin; monitor as indicated if the individual is fasting before a medical procedure, has returned to the facility after a significant absence, or has an acute infection or illness. Monitor A1C on admission (if no results from a previous test are available) or when diabetes is diagnosed, and every 6 months thereafter. Adjust monitoring frequency depending on glucose control and resident preference. For the diabetic resident whose blood sugar is well controlled with insulin, how often should you monitor A1C? Depending on the blood sugar results, treatment prescribed by the physician should be initiated. Based on the patient assessment, including causes and complications, the physician will order appropriate interventions, which may include treatment of underlying conditions causing impaired glucose tolerance; diet and lifestyle modifications, where feasible and accepted by the resident; oral hypoglycemia agents; and/or insulin. As a general rule, if short-acting (“sliding scale”) insulin has to be administered frequently, the physician should consider initiating or adjusting intermediate- or long-acting insulin. The physician will authorize pertinent periodic evaluations such as ophthalmology and nephrology, as indicated and will order desired parameters for monitoring and reporting information related to diabetes or blood sugar management. The staff will incorporate such parameters into the Medication Administration Record and care plan as well as identify and report complications such as foot infections, skin ulceration, increased thirst, or hypoglycemia. For example, urgent notification may be indicated if the individual has not eaten well or consumed sufficient fluids for 2 or more days and has fever, hypotension, lethargy or confusion. The physician will help the staff clarify and respond to these episodes. In addition, the staff and physician will manage hypoglycemia appropriately. Over-treatment of hypoglycemia can result in rebound hyperglycemia. It is important to avoid over-treatment of hypoglycemia, which can result in rebound hyperglycemia and hamper subsequent glucose control. For example, a borderline low blood sugar in the absence of signs and symptoms may not need any acute intervention, and may or may not suggest the need to modify oral hypoglycemia medications or insulin. An example of appropriate treatment of hypoglycemia for a responsive individual would be 15 g to 20 g of carbohydrate in the form of glucose, sucrose tablets, or juice, combined with a sandwich, crackers, or other light snack containing protein. For someone who is lethargic but not comatose, treatment might include oral glucose paste rubbed onto the buccal mucosa, intramuscular glucagon, or intravenous 50% dextrose. Since diabetes is a complex disease with different types and affects many different systems it is imperative to explain not only the care, treatment and co-morbidities but also the rationale for such measures. Collaborative family planning can assist the diabetic in establishing lifestyle changes which can positively impact the disease. Patients and their families need to express their concerns about how diabetes will affect the patient, family life and their future. Resistance to changes in diet, exercise and/or understanding of preventing long term complications should be expected. Prepare how you will explain the reasoning behind changes to better facilitate difficult conversations. For example, a resident may state that his diet includes 3 beers a day and he does not plan on changing. Explain how this can best be fit into his dietary routine. Help him to decide upon the best way to eliminate other carbohydrates or suggest that he try a light or non-alcoholic beer. Working with the resident and their family will always lead to the best compliance and outcome. True or False? The best way to ensure compliance is to work with the resident’s preferences, even if they are not ideal. The nursing staff is often the “first line of defense” in a long-term care setting. Frequent interaction with the resident puts the nurse in the best position to assess the resident frequently, becoming familiar with each individual’s normal state and quickly noticing deviations. In addition, that frequent interaction can also help you get to know the resident as an individual, and to tailor a treatment plan to his or her needs. An individualized plan is an enormous factor in resident compliance and treatment success. The Certified Nursing Assistant has more frequent contact with the resident than perhaps anyone else in the long-term care facility. Responsibilities around the resident’s daily needs make the CNA one of the most important factors in their quality of life. Your facility will have a set of guidelines and procedures, and you should make yourself familiar with those. This unit outlines typical routine care of the diabetic resident, along with observations you may be required to make regularly. Much of routine diabetic care centers around preventing wounds and infection. Duties will vary depending on the degree of the resident’s independence. For a resident who is highly independent, routine care may lean more toward monitoring his/her condition. At the opposite end of the spectrum, if the resident is very ill, he/she will depend on you for a lot of help. There’s also a spectrum of required monitoring, with more dependent residents needing more diligent observation. There’s a direct relationship between oral health and overall health. For residents who can manage many daily routines independently, you will still be required to monitor their condition. Make sure that they are practicing good mouth care, including the use of antiseptic mouthwash. There’s a direct relationship between oral health and overall health. If the resident is ambulatory, make sure he/she is getting adequate exercise and is using proper diabetic footwear; watch for changes in gate, stance, and level of activity. Monitor hydration. If the resident is incontinent, diligently provide incontinence care. Regular foot care should also be part of routine care. Watch closely for signs of foot problems. What are some areas where change may be considered warning signs? Watch for signs of irritation or inflammation, as well as for lesions. Pay special attention to the resident’s feet: they are especially vulnerable. Wash and dry feet daily, then apply lotion (except between the toes). Make sure the resident has shoes and socks that fit well. Avoid tight or rolling hose, provide proper footwear, and check shoes for foreign objects. Diabetics often lose the ability to feel that something is stuck in their shoes and a lot of damage can happen if you don’t check. Inspect their feet daily for blisters, changes in color, rashes, or cuts. Make sure the resident gets podiatric care of nails and calluses. Discourage smoking as it damages circulation. Also to avoid circulatory damage, discourage and avoid crossing the legs at the knees. Diabetes is a leading cause of blindness, so watch carefully for signs of visual impairment. Monitor the resident’s visual Activities of Daily Living (ADLs). Is the resident aware of the environment? Can he/she locate things and visually respond to the environment? Is he/she able to focus on an object or person and visually interact? Watch for signs of irritation in the eyes, ears, nose, and mouth, and note any discharge or caking around the eyes or nose. Watch for lesions, dryness, or cracking around the mouth and lips, especially if the resident is unable to take food or fluids by mouth. If the resident does take food by mouth, ask if he/she notices any changes in the taste of food. Check dental and gum condition. Do you notice unusual odor? Does the resident have any bleeding with brushing? Are there issues with denture condition and fit? Take note of unusual stiffness in the neck. Watch carefully for signs of chest congestion or shortness of breath. Also ask the resident if he or she is experiencing breast irritation, discharge or tenderness. Pay attention to the abdomen as well: is it distended or tender? In the genitourinary area, watch for distension, tenderness, discharge, irritation, or inflammation. Watch for weakening on one side more than the other. Watch for signs of joint problems such as tenderness, swelling, or deformity, and changes in range of motion or mobility. Diabetes can also affect the nervous system, so monitor for lateralizing weakness — is the resident weaker on one side than on the other? Has the resident developed any new tremors? Are there changes in affect or alertness? Which is the following is a potential sign of diabetes-related nerve damage? If you notice any signs that the resident’s condition is deteriorating, take appropriate steps to notify the care team, in accord with your facility’s procedures. Be aware of the signs that a resident may require immediate intervention, particularly signs of extreme changes in blood sugar levels. As a CNA, you probably have more interaction with the resident than anyone else. Therefore, you are in a position to make a tremendous impact on the resident’s quality of life. You’re also in a position to have a huge influence on the care team. Give the resident the care and attention he or she needs; give the care team the information they need. Like an ambassador, you can make sure that both sides work in harmony. The attending physician is responsible for complying with the currently accepted standards of diabetic medical care. The medical plan of care should reflect the current ADA standards of diabetes care. As a member of the care team, you should know these responsibilities so that you can effectively communicate with the physician to ensure that residents receive the care they need. This unit describes the physician’s responsibilities and outlines some of the evaluations in which you will be involved. Describe the attending physician’s responsibility regarding implementing the diabetic resident plan of care. List screenings and labs that the physician may order upon admission and regularly thereafter. Discuss interventions and risk management strategies with the attending physician. The attending physician should be involved at the time of admission, and at least 4 times a year thereafter. The initial visit should include a thorough medical evaluation, including screenings and labs as described in later pages of this unit. The physician is also responsible for determining the most appropriate diabetes medications, dosages, and schedules. In most cases, if the resident has been on sliding scale treatment, the physician will recommend transitioning to a tight glycemic control plan within 60 days post admission. In addition, the physician will evaluate the resident’s blood pressure and lipid levels and either create a plan to get these values into accepted therapeutic ranges (see Table 5.3.1), or document risk-benefit rationale why such targets are not feasible in a specific resident. The attending physician is also responsible for assuring that the resident’s immunizations are kept current. Some immunizations and the rationale for their use are listed below. Flu Vaccine—Shown to reduce diabetes-related hospital admissions by 79%25 during flu epidemics. Pneumovax—Diabetics are known to have increased risk of bacteremic (bacteria spreading into the blood) infection associated with pneumonia. Pneumovax should be repeated every five years in residents over 65 years of age, or those who have Nephrotic syndrome, CRD, or are otherwise immunocompromised. Zostavax—Any challenge to the immune system could worsen diabetes. Therefore, it is best to prevent shingles rather than respond after it presents. Tdap Vaccine—As with shingles, it is better to prevent whooping cough than wait until it presents. How often should a resident over 65 years of age receive Pneumovax? Diabetes-related medications and care plan should be adjusted as needed, especially if blood glucose levels fall below 70 or exceed 200. For residents who are pre-diabetic or at risk, type 2 diabetes may be prevented or delayed if the physician addresses the underlying causes or predispositions associated with its development. In a Finnish study (Tuomilehto, et. al., 2001), individualized instruction on weight reduction and food intake, combined with guidance on increasing physical activity, resulted in a 58%25 reduction in incidence of diabetes in a study of middle aged, obese subjects. Studies indicate a benefit in the use of oral hypoglycemic treatment prior to the development of overt diabetes in residents who are at extremely high risk. Even so, life style moderation is twice as effective as pharmaceutical intervention in preventing onset of diabetes. Primary life style strategies should include weight reduction: focus on low-fat diet first and if that is not sufficiently effective, address caloric moderation. The resident should also be encouraged to increase exercise, quit smoking, and moderate alcohol intake. True or False? Life style moderation is twice as effective as pharmaceutical intervention in preventing onset of diabetes. Recent studies have shown that reducing LDL below 70 mg/dL leads to an even greater reduction in acute coronary events and that the risks associated with higher doses of a Statin are significantly outweighed by the benefits, in high-risk residents. ASA therapy has been shown to reduce risk of MI by 30%25 and strokes by 20%25. After an initial stroke Aggrenox or Plavix should be considered. The care team can work most effectively only when all members fully understand expectations and communicate with one another clearly. You should have thorough knowledge of the attending physician’s role and the kind of information required to support it. Your facility may have specific tools for evaluating and reporting changes in the resident’s condition. Become comfortable with using these tools and discussing such changes, and other care issues, with the physician. As a member of the care team, the consultant pharmacist works actively with other members to optimize pharmaceutical interventions for the resident. The pharmacist is a resource for regulatory, formulary, and clinical issues. This unit briefly reviews the pharmacist’s responsibilities with respect to the diabetic resident. Articulate the pharmacist’s responsibilities in the care of the diabetic resident. Understand the pharmacist’s role regarding the Drug Regimen Review and other regulatory issues. Identify other ways the pharmacist can participate in the care team. The Pharmacist is responsible for DRR monitoring along with other regulatory requirements. The Drug Regimen Review (DRR) is a federally mandated monthly review of the drug regimen for each resident in a nursing facility. The consulting pharmacist is responsible for DRR monitoring, as well as other government regulatory requirements such as individualized pharmacy therapeutic consultations and compliance issues. The pharmacist will also communicate with the physician about any issues regarding the DRR. The pharmacist will review drugs that may cause hyperglycemia or hypoglycemia, track laboratory screening, and provide pharmacokinetic dosing services. If the resident has been on sliding scale therapy, the pharmacist will help in tapering off. The pharmacist may also review admission orders and periodically assess prescription efficacy. True or False? For diabetic residents, the pharmacist will help initiate sliding scale therapy. The pharmacist will provide pharmaceutical information and educational resources for staff, as well as for the resident and his/her family. Supplemental care tools may also be provided by the pharmacist. With regard to Formulary issues, the pharmacist will assist with Part A costs to the facility, Part D, and prescription drug plans (PDPs). The consulting pharmacist has responsibilities in assisting with the resident’s care, ensuring the facility’s compliance with regulations, and communicating with the physician and other members of the care team. He or she may also provide educational resources and individualized consultations. Be aware of the ways a pharmacist can participate in the resident’s care and make use of these important contributions. evaluated by blood glucose log. artery in the arm – a measure of peripheral vascular compromise. Anemia – A low red blood cell count. method or by a blood draw. indicate kidney disease or dehydration. action of the antidiuretic hormone (ADH). insulin. Disease is progressive. There is no cure. water for an excessive period of time. ability to filter metabolic by-products from the blood into the urine. grams of glucose. This measures the ability to handle a challenge of added sugar in the blood. inadequate supplies to support metabolism and excessive supplies that cause cell damage. levels may indicate less chance of heart attack. are removed. The resident must visit the center three times weekly. Hyperglycemia – High blood sugar. Over 125mg/dL. Hypertension – High blood pressure. Systolic over 120 OR diastolic over 80.
resident with arteriosclerosis – (hardening of the arteries). cannot get into the cells to be metabolized. include fruity odor to breath, a speed up or slow down of breathing, and a very sleepy feeling. indicate increased risk of heart attack. glycemic control, positive lipid profile, ideal body weight and normal blood pressure. inaccurate sensation to heat, cold or pain, or balance. exercise, diabetes can usually be avoided. everyone. It takes quite a bit of self-management and learning but offers far more freedom. Some residents are not candidates for this type of dialysis. particular time of last meal. Time of last meal, however, should be recorded with the results. Sick days – Additional precautions that must be addressed on days when a diabetic resident is ill.
oral medications to insulin use to control blood glucose levels. resident’s blood to travel to and from the dialysis machine.